You can use FraudLabs Pro SMS Verification to automatically validate the buyer’s cellphone number if the order was flagged for review after the checkout process. In order to authenticate a buyer’s cellphone number, FraudLabs Pro will email the buyer with the page URL to complete the SMS Verification. On that page, the buyer will be required to enter a valid phone number and request for an SMS (Short Message Service) that contains the OTP (One Time Passcode) to be sent. Then, the buyer will need to respond by filling in the correct OTP received to successfully authenticate himself/herself. This will certainly lessen your efforts to manually contact them for further verification purpose. This tutorial will demonstrate how to configure this feature using the FraudLabs Pro SMS Verification plugin. 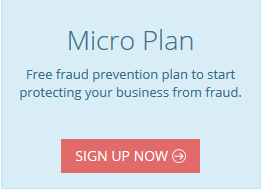 Please note that you must also install the FraudLabs Pro for WooCommerce plugin in your WooCommerce store for this to function. You also need the SMS credits for this solution. Please visit the SMS Verification Add-On page to learn more about credits and pricing. 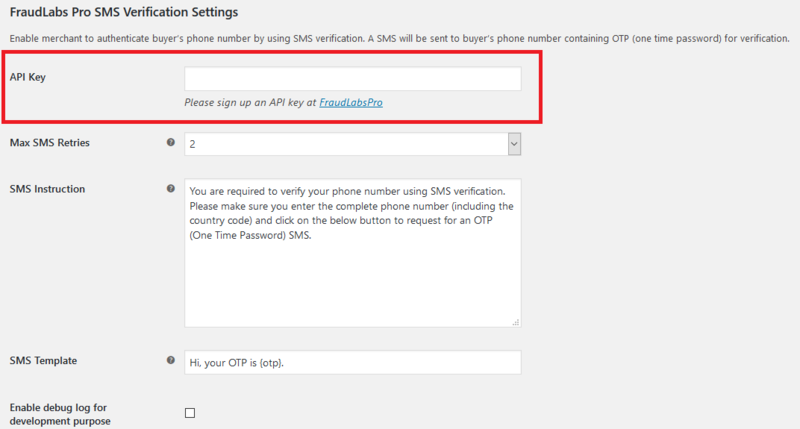 Configure the FraudLabs Pro SMS Verification Settings by entering the FraudLabs Pro API Key. Click on the checkbox of Enable SMS Verification when order flagged for Review.